You have a ransomware infection installed on your computer if your files have been encrypted and you see .teamo appended to them. Most likely, Teamo Ransomware is the one you should blame for ruining your files because this ransomware infection is the one that uses this extension to mark encrypted files. At the time of writing, this HiddenTear-based ransomware infection did not demand money from users, so we suspect that it has been developed and now ruins users’ personal data just for fun. Of course, we cannot promise that its new updated version asking money will not be released. You must delete Teamo Ransomware from your computer right away no matter which version of this threat you have encountered because even though it does not have a point of execution, you might still launch it accidentally and get your all new files locked too. The removal of the ransomware infection should not be very complicated, but we cannot say the same about the decryption of personal files. In other words, we cannot promise that you could decrypt those files encrypted by Teamo Ransomware easily. It will not take long to find out about the entrance of Teamo Ransomware because it will immediately encrypt your personal files. It does not encrypt all files on users’ computers. Instead, it targets only those folders that usually contain the most valuable files, e.g. %USERPROFILE%\Pictures, %USERPROFILE%\Downloads, %USERPROFILE%\Videos, and others. Research has shown that it searches for files with .jpg, .csv, .sql, .sin, .php, .asp, .aspx, .html, .psd, .mp3, .mov, .avi, .pdf, .ink, and other filename extensions and then locks them all when it finds them. These affected files get the .teamo extension appended to them, so it is impossible not to notice that they have been encrypted. 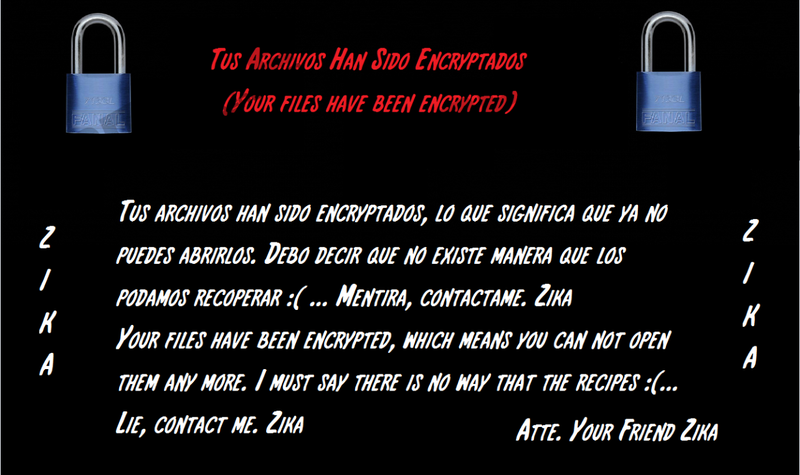 The encryption of files is, of course, the main activity Teamo Ransomware performs on victims’ computers, but the inability to access personal files is not the only symptom showing that its entrance was successful. When it infiltrates victims’ computers and encrypts files, this threat also drops a ransom note Hola como sea jaja.txt on Desktop (%USERPROFILE\Desktop) and ransom.jpg in %USERPROFILE%. Additionally, it might set the latter file as a new background image. If you read any of those files, you will see that cyber criminals behind this threat do not demand money from users. You will not find an email or other contact details indicated in any of these files either. Even though it is impossible to purchase the decryption tool from cyber criminals, it does not mean that users cannot restore their files. Users who have copies of the most valuable files can easily restore them from this backup. Sadly, there is no other way to decrypt files for free. No matter you manage to decrypt your files or not, you must delete the ransomware infection from your computer as soon as possible. Ransomware infections tend to infiltrate users’ computers without their knowledge; however, we cannot say that users do not contribute to their entrance themselves in any way. It has been observed that the majority of people who discover Teamo Ransomware on their computers download malicious attachments from spam emails. We do not blame them – these attachments do not look harmful at all and often look like important documents, which explains why so many users open them and allow malware to enter their computers without even realizing that. We have to admit that ransomware infections are one of the sneakiest threats, but we would lie if we told you that users cannot prevent them from entering their computers. There is one easy way to prevent all kinds of malicious applications from entering the system – you just need to install a security application on your computer. You will not remove the .teamo extension from your files, i.e. you will not decrypt them by deleting the ransomware infection from your computer, but you still need to erase that infection from your system so that it could not encrypt any other new files. If you decide to erase it manually, you should follow our step-by-step instructions. As you can see, you will just need to delete two files dropped and change your Wallpaper. Alternatively, you can use an automated antimalware tool to delete this threat. Sadly, it will not unlock any files for you either. Enter regedit.exe in the box and click OK.
Open HKCU\Control Panel\Desktop and locate the WallPaper Value. Open %USERPROFILE% and delete ransom.jpg. Delete Hello Hi Hola como sea jaja.txt from %USERPROFILE%\Desktop. Remove recently downloaded files you find quite suspicious. Quick & tested solution for Teamo Ransomware removal.